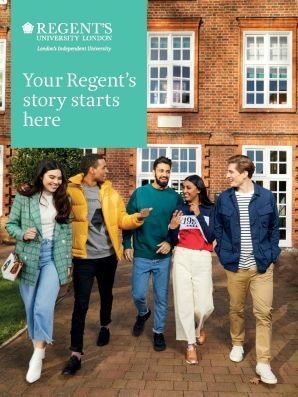 Take a look at our prospectus for a glimpse of life at Regent’s, from the academic programmes on offer to the social and sporting activities you can get involved with. Living and studying at Regent’s is a unique experience like no other. Join us today and start your Regent’s story. Regent’s is London’s only independent, not-for-profit university, with a highly cosmopolitan community, based in royal Regent’s Park and Marylebone. Regent’s is a superb place in which to live and study, just minutes away from all that this world-class city has to offer. We offer a range of programmes at foundation, undergraduate and postgraduate level, along with a range of language and professional short courses. We offer English courses in London to suit all ability levels. Situated in an idyllic private estate in royal Regent’s Park, our Regent’s campus is just minutes away from the centre of the city. Whether you need advice with your studies or you're looking for the next event on campus, you'll be able to find it all here, or at the Student Hub, located on the ground floor of the Acland building.